Water – Used for wood, cloth, paper, plastics, coal and fires involving solids. This type of extinguisher works by cooling burning material. NOT FOR USE ON ELECTRICAL FIRES. Foam – Used for wood, cloth, paper, plastics, coal and fires involving solids, liquids such as grease, fats, oil, paint or petrol. 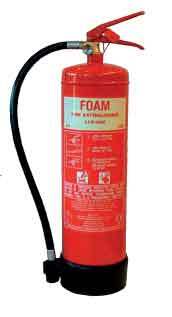 This type of extinguisher works by forming a fire extinguishing film on the surface of a burning liquid. It has a cooling action with a wider extinguishing application than water on solid combustible materials. Dry Powder – Used for liquids such as grease, fats, oil, paint and petrol. This type of extinguisher works by knocking down flames. CO2 – Used for liquids such as grease, fats, oil paint and petrol. This type of extinguisher works by vaporising liquid gas which smothers the flames by displacing oxygen in the air. Extinguishant Systems – Fixed systems designed for specific areas such as computer rooms or special equipment. Fire Blankets – For fires involving both solids and liquids. This resource is particularly effective for small fires in clothing and for chip and fat pan fires provided the blanket completely covers the fire. This type of extinguisher works by smothering the fire. Contact us for full product lists and prices.